the Swedish Nobel Foundation has had more than ample time in which to act on the Nobel Prize for Physics which it conferred in 2006 upon a fraudulent discovery. it has not only not acted to address the fraud, but it has gone out of its way to resoundingly reaffirm the said fraudulent discovery through its worldwide Nobel YouTube Campaign and the associated media blitz. the scientists of the US National Aeronautics and Space Administration (NASA) – funded by the taxpayers – have continued to lie in their official web pages about the performance of the COBE Satellite, the vehicle of discovery at issue. 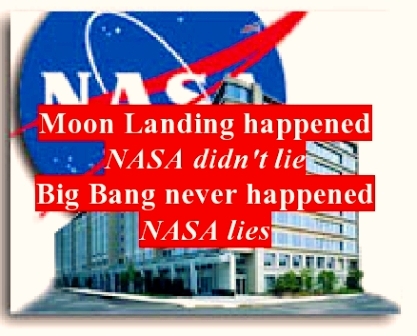 the “Moon-landing-never-happened” adherents may be a few sandwiches short, NASA has committed, and is covering up, far grander science fraud about mankind’s home. 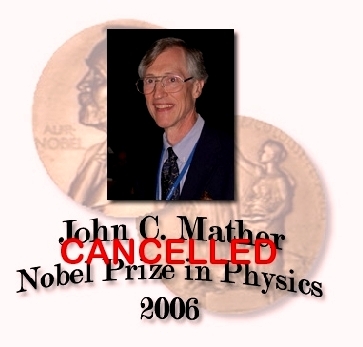 the World’s precious and innocent young generation – even children – today is being repeatedly subjected by the scientific establishment to “inspiration” from the fraud Nobel Laureate John Cromwell Mather. the scientific establishment has maintained a significant silence on this matter which was theirs, most of all and before all, to come to terms with. in spite of due official notification and great public coaxing, no denial of the allegation has come from any of the myriad possible quarters, for a period now approaching three years. people are not being told the truth that these “few such people” are the only people who matter: Myself the highest scientific authority, and three successive NASA Administrators – Mather’s ultimate bosses who are not only his employers but also are direct reports to the President of the United States. the expert scientific establishment and the Nobel Foundation whose support Mather seems to point to are evidently inept, incompetent and/or corrupt. The silent majority (the scientific establishment at large) whose overriding support John Mather claims to have is not in evidence as supporting him against the allegation of science fraud. They are in fact clueless. Government funding of Big Bang Cosmology continues to proceed at an escalating level – based on its “verification” by COBE Satellite, and upbeat scientific conferences on the subject around the World suggest they will not acknowledge this fraud. supreme leaders of the scientific establishment such as Steven Weinberg continue to sell popular science books on Big Bang Cosmology and gain financially from this activity when in fact these books are a pack of scientific lies parading as proven science; this is iconic of the fact that the scientific establishment is not only engaged in a grand cover-up of the fraud, but some of them are literally banking it – hand over fist. 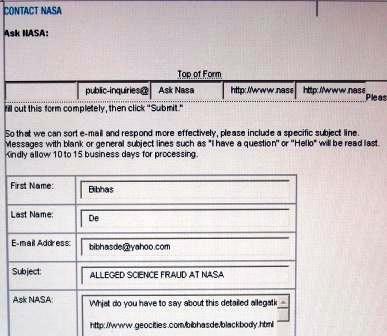 NASA FRAUD: THEY FINALLY DEFRAUDED THE WORLD! all persons of honor shall – in defense and in furtherance of the public good – abide by this citizen’s action and cease acknowledging this Award from here until the ends of time. No entrenched power groups should be allowed to preserve a lie before the World through the force of their authority and the height of their pedestal and the whiteness of their toga. Any objections to this decision should be submitted to this office along with a certification from the United States National Aeronautics and Space Administration that the aforementioned discovery is not fraudulent. 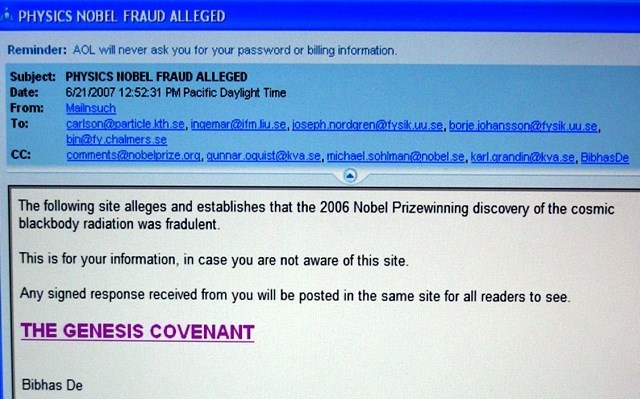 This entry was posted on January 17, 2010 at 7:31 pm and is filed under NASA's COBE Satellite fraud, Nobel Physics discoveries disappearing. You can follow any responses to this entry through the RSS 2.0 feed. Responses are currently closed, but you can trackback from your own site.